Go to Control -> Users management menu to see the list of current users. Now click on Abilities link on the designated user line to see the following dialog. Here you can see the list of the servers which you have now in your account. Select those which you need to give access for and slick on Save. 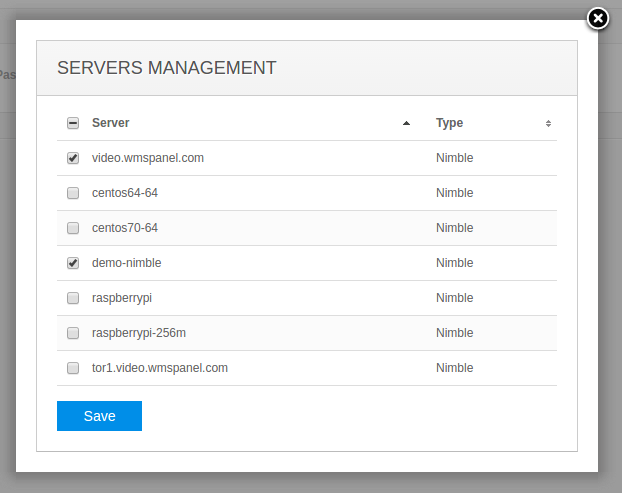 After that, the selected user will be able to do all the setup of his/her Nimble Streamer instance, just like the account administrator. Any WMSPanel user may enable two-factor authentication for his user account. Please read this article for more details. If you have any questions about our feature set, please contact our helpdesk.